A municipality was investigating inexpensive ways to minimize sludge buildup in its wastewater lagoon system. There was no immediate need to dredge, but the municipality was interested in BioSpikes 4000 as a preventative treatment with low investment and minimal risk to ongoing treatment. The lagoon system treats 76 m3 (20,000 gal) per day. BioSpikes were added to the settling zone, which is 2.74 m (9 ft) deep and contained approximately 0.61 m (2 ft) of settled sludge. The sludge levels were monitored for seven months. The sludge levels in the treated area dropped by 38% – 20 cm (8 in), a 7% increase in operating volume. In March 2015, Treatment Plant Operator magazine published an online exclusive on the benefits of bioaugmentation from an operators perspective. A 3 mgd oxidation ditch in Eastern Pennsylvania experienced a harsh winter with temperatures below 50°F. As a result settling was poor, around 900 mg/L, BOD, TSS, pH all were normal for the plant. An augmentation program was started with Toler-X 4100 adding 10 lbs per day for 2 days, 5 lbs per day for 3 days then maintaining 3 lbs per day. A wastewater treatment plant in Pennsylvania was having major algae concerns in their EQ basin. The plant averages 1.5 mgd flow and the EQ basin is 59’ x 65’. Algae had been a nuisance and the current cleaning method was power washing the basins on a regular basis. 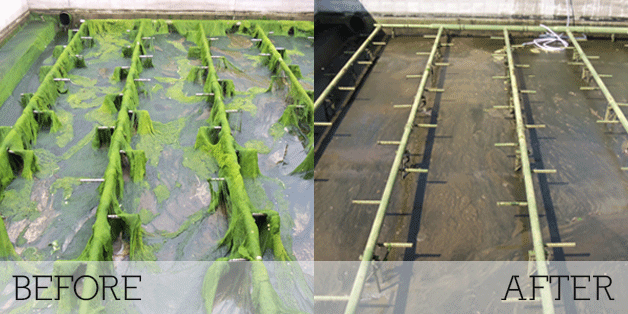 The first picture was taken 3 weeks after the basin was power washed and you can see it was covered in algae.